South Korean President Moon Jae In visited North Korean for the Inter Korea Summit this past Tuesday to Thursday. As part of the 52 member delegation from South Korea, K-pop idols Ailee and Zico went to Pyongyang to perform for the North Korean audience. This is the second time this year where South Korean musicians visited North Korea to perform. Among the delegation also included conglomerate executives from Samsung, SK Group, LG Group and Hyundai Motor Group. Ties between North and South Korea are warming up with recent summits, cultural exchanges and dialogue for what many see as a step closer to reunification in the peninsula. Today, 6:45 p.m.: Eun Han gets her memory back. She tries to get her hands on the phone she asked Kang Woo to find the owner of. When Kang Woo finally finds it, an unexpected person snatches it away right from under him. Today, 7:30 p.m.: Eun Han pushes Kang Woo away, fearing she’d get him into harm’s way. Despite her efforts, Kang Woo plans a way to face Chan Ki and rescue Eun Han. Kang Woo warns Eun Han that in order to take revenge on Chan Ki, who drove her to near death, she must keep quiet about her memory returning. Will she be able to follow through on her revenge plan? Monday, 7:45 p.m.: Seo Ri tells Woo Jin she’d do anything to hold onto her love for performing. Seeing Seo Ri preparing for the festival makes Woo Jin sad for her. After a much agonizing time, Seo Ri decides not to perform in the festival. The day of the One Music Festival, Director Rin makes an unexpected proposition, much to Seo Ri’s surprise. Tuesday, 7:45 p.m.: Woo Jin and Seo Ri head over to cheer for Chan’s at his national meet. There, they run into a mysterious person. Chan is faced with a challenge, when his ankle is in pain right before the individual event. His determination to profess his feelings to Seo Ri after he wins the competition, helps him pull through. Wednesday, 7:45 p.m.: Kang Ho and So Eun establish their feelings for each other. But with Soo Ho’s appearance, misunderstandings are made between Kang Ho and So Eun. Hae Na tries to figure out Ho Sung’s feelings, and announces something shocking in court. Thursday, 7:45 p.m.: Kang Ho gives a refreshing verdict and wraps up Hae Na’s narcotics case. At his office, he is surprised to hear that he has turned in a resignation letter and sees his days of being a judge ending. Friday, 7:45 p.m.: Gwang Jae and Young Ha somewhat settles into their new business. Tae Il loses consciousness after all the overwhelming emotional pain and stress he feels. Hyo Dong sneaks into Soo Hee’s home to find Gye Dong’s recipe book. Young Ha is heavy-hearted over Tae Il’s health condition. Saturday, 7:45 p.m.: Hyo Dong raids Tae Il’s office while he’s in the hospital, to find the recipe book and gets caught by Seo Hee. Young Ha nurses Tae Il at the hospital and he asks her if she’ll be coming back the next day. Gwang Jae finds out Young Ha went to care for Tae Il. While on an errand to Tae Il’s house, Seo Hee finds something important. Over 80% of us use a search engine before making a purchase or using a service. However, you or your SEO company need to adjust your SEO strategy regularly to keep abreast of the way search engines index websites, competitor activity and changes in your business priorities. Clickthrough’s new free SEO audit app has been introduced as a proactive tool to help business owners get a quick score of their website and a competitors web pages against a set of important on-page SEO factors, and adjust their SEO strategy accordingly. This SEO audit tool performs an in-depth keyword analysis of any landing page on your website, and a competitor’s page, against a set of key organic search ranking factors. The results of the SEO audit are presented on your screen and emailed to you, most often within 30 seconds of submitting your URL, target keyword and your email address. Your SEO audit summary scores your web pages against key SEO factors such as load speed, quality of URL, meta tags, copy and code, social linking, sitemap linking, mobile search, domain, and even analyses your backlinks. It provides you with immediate recommendations that, if applied correctly, should allow you to fix any parts that are underperforming. We recommend you contact your SEO Agency, or an SEO expert, to help you implement the recommendations from the results of your free SEO audit. Clickthrough’s free SEO audit app is a great way to help you get and stay ahead of your competition online. Find more from Clickthrough SEO Auckland on InfoPages. Wise phones give the capability to the user to perform a plethora of activities with higher tech accessories. The absolute most important thing to check at when selecting your smartphone is going to be the network kind and speed. With quite a few plans available you need to find a mobile phone to suit you. Contract mobile phones are the perfect solution for those who should stay in contact with family and friends all of the time. Thus mobile phones are perhaps our best friends that have provided us with total freedom from carrying several devices to execute different tasks. Call our group of business mobile phone experts today to talk about your requirements and aid you in finding the ideal mobile phone and plan for your requirements and your financial plan. Phones are subject to availability at the moment you wish to upgrade. A number of our business mobile phones include stacks of superfast data, helping you to remain connected wherever you may chance to be. One other great thing about business mobile phones is that phones which fall in the smartphone’ category have a complete collection of additional features that could be accustomed to the benefit of the company. There are a few great business mobile phones which have been making waves on the market. If you are able to afford to obtain a smartphone with more memory, that’s probably safest. Smartphones utilize an operating system which is fundamentally the software that makes it possible for them to run programs and apps. You’re able to acquire a variety of smartphones on lots of networks so there’s no doubting you will be in a position to find business mobile phones deals with your perfect provider and the best-suited handset. If you anticipate using your cellular broadband regularly then you should check at a package that comprises a high or even unlimited download allowance for a superior value for money. It’s really simple to use mobile broadband irrespective of which provider you choose to go with. Very similar to mobile phone coverage, mobile broadband employs a similar process regarding utilizing a cell signal to set up a connection. 1 way for low-cost small business broadband is to combine your company broadband and phone packages. Business broadband made for commercial use includes additional benefits you just don’t get with home broadband. When you choose to move services to One bill from a different supplier, we will notify your present provider to explain that we’re now providing your expert services. Some streaming companies require paid subscriptions. They may not have apps available on all mobile operating systems. A cell broadband service lets you connect to the Internet when you’re on the go. Mobile customers may get extra logins for extra service numbers. Customers with a present business phone line can only get an offer package in the event the line does not yet have broadband on it. The monthly price increases by RPI annually. Other prices may increase too. That means you will always be in a position to observe the least expensive prices for the best phones with contracts having the most generous data allowances. Obviously, everybody wants to find the very best deal in regards to business mobiles, but we don’t always have enough time to do all of the crucial research. You want to make certain that you receive the deal that is most suitable for your institution’s size, requirements and price range. Business phone deals that include a touch screen are a really excellent idea if you prefer easy accessibility to all pieces of your handset along with design and functionality. It’s important to completely research your company mobile phone deals with many diverse companies as well because you may not be paying the ideal price for the service you’re receiving. Business mobile phone deals that have smartphones are also proving popular due to the tariffs, networks and offers they come with. Global Plantar fasciitis splints Market Report provides an exclusive tool for evaluating the market, feature opportunities, and supporting strategic and tactical decision-making from 2018-2025. Global Plantar fasciitis splints Market report recognizes that in this rapidly-evolving and competitive environment, up-to-date marketing information is essential to monitor performance and make critical decisions for growth and profitability. It provides information on trends and developments, and focuses on markets and materials, capacities and technologies, and on the changing structure of the Global Plantar fasciitis splints industry. COMPANY 6 and many more. For Market chain analysis, the report covers upstream raw materials, equipment, downstream client survey, marketing channels, Market development trend and proposals, which more specifically include valuable information on Global Plantar fasciitis splints key applications and consumption, key regions and consumption, key distributors , major raw materials suppliers and contact information, major manufacturing equipment suppliers and contact information, major suppliers and contact Information, key consumers and contact information, and supply chain relationship analysis. Global Plantar fasciitis splints Market Segment by Application includes: – APPLICATION 1, APPLICATION 2, APPLICATION 3, APPLICATION 4, APPLICATION 5 and many other. Geographically, this report is segmented into several key Regions, with Sales, revenue, Market Share (%) and Growth Rate (%) of Global Plantar fasciitis splints Market report in these regions, from 2013 to 2023 (forecast), covering North America, China, Europe, Southeast Asia, Japan, India. A popular link-building tactic is also an excellent way to identify content marketing topics. When combined, broken link building and content marketing could generate traffic for your site and provide a way to engage visitors. While broken link building and content marketing have similar goals, at some businesses, particularly mid-market and enterprise level companies, the folks working on search engine optimization and the folks developing content are on separate teams with different departmental goals. Bringing these two groups together and using broken link building to spark content marketing campaigns may improve results for both of these marketing techniques. SEO broken link building is a three-step outreach technique. First, research websites relevant to the industry and customers your business serves, identifying broken links, which are HTML links aimed at pages that are no longer available. Second, your business would develop useful content that replaces, if you will, the content promised through the broken link. Third, you would contact the influential website’s owner or manager, offering your new content as a replacement. Content marketing, on the other hand, is the act of creating, publishing, and distributing content such as articles, videos, podcasts, whitepapers, infographics, and similar with the goals of attracting, engaging, and retaining potential customers. Content marketers want to create something of value, something that is useful, informative, or entertaining. It also tends to have three general steps. First, identify topics that will help or engage potential customers in some way. Second, create good content around the topic, publishing it on a blog, on social media, or similar. Three, distribute or promote the content. The three steps of broken link building and the three steps of content marketing are noticeably similar. A content marketer has dozens of methods for generating content topics. Researching relevant websites to identify broken links could be one of them. Consider an example of how to find broken links on an influential website. Say we own an online kitchen supply store. We make our living selling cookware, utensils, and kitchen gadgets. As part of our marketing strategy, we publish useful cooking and health-related articles on our store blog. We’ve done some research, and we know that the Academy of Culinary Nutrition is an important website for our industry. There are tools we could use to find broken links on the Academy’s website. Some of the best include Ahrefs, PowerMapper’s SortSite, SEMrush, Screaming Frog, and the Dead Link Checker, among many others. We want to choose one of these tools to help us locate broken links. Using Ahrefs we’re able to identify 48 pages on the Academy’s website that have broken, outbound links. The Ahrefs tool identifies 48 broken links. Among these was a link aimed at a strawberry chia jam recipe. The third link in this list is the broken link. If we can create a great strawberry chia jam recipe of our own, we might be able to get this link. Copy the broken URL link and open it in a new browser tab as a test. In this case, the page is, in fact, returning a 404 error. Thus we’ve confirmed that we have a broken link opportunity. The next stop is Internet Archive’s Wayback Machine. The Wayback Machine stores copies of old web pages. It had a single copy of the jam recipe that the Academy originally linked to. Internet Archive’s Wayback Machine has a copy of the web page that we can use as a reference. We know that the original post had several compelling photographs and an easy-to-follow recipe. It is not surprising that the Academy wanted to link to it. 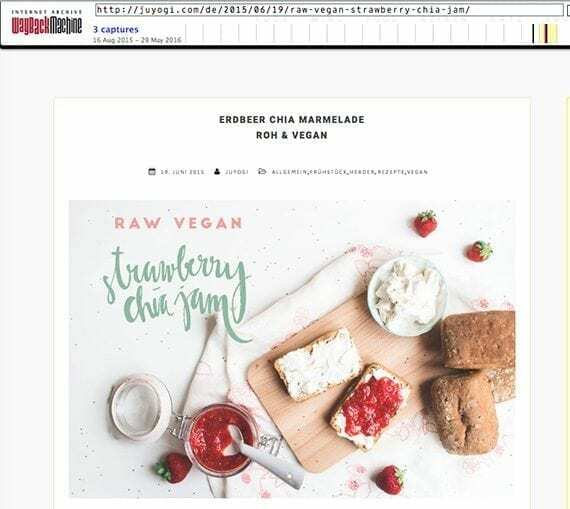 Our goal is to not only replace the content that a publisher, such as the Academy of Culinary Nutrition, had previously linked to, but also improve it. In the example above, we identified an opportunity to write a strawberry chia jam recipe article. But we want to do it better to provide an even better page for the Academy to link to. Anytime you use broken link building to generate content ideas, always aim to improve on the original. You want to provide real value. Value is important. It will make the final step in broken link building a lot easier. And this last step is when you reach out to a publisher and offer her the new content to fix the broken link. In our example, we would contact the Academy with an email. 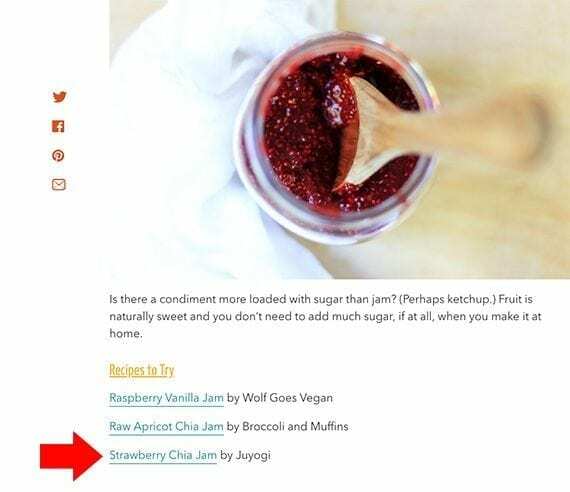 In the section on jams, the link to Juyogi’s strawberry chia jam now returns a 404 error. I thought you would like to know. For your consideration, I have a delicious strawberry chia jam recipe to use as a substitute. You can find it here [our link goes here]. So that’s it. We just used broken link building to discover a topic for our next content marketing post and, perhaps, obtain a fresh in-bound link. Now we can use our normal content marketing techniques to continue promoting the post. We have SEO and content marketing working together.